The belief that debts have to be repaid is one the cornerstones of the austerity narrative. But we have the tools to challenge it. “Financial capitalism is photophobic; it doesn’t like the light and thrives on opacity”, says Gerardo Pisarello. He is deputy Mayor of Barcelona, where the panel he speaks on takes place. This late November event is the culmination of several days of convergences between NGOs and social movements to formulate a ‘Common Project on Debt for Europe’. Shedding light on the financial system is exactly why the discussion topic is debt audits. The movements for challenging unjust debts have their roots in the global South, where entire countries were subjected to cuts, privatisation and resulting poverty in the form of structural adjustment in the wake of the 1980s debt crisis. After bank bail-outs brought the debt crisis to Europe after the 2008 crash, calls for auditing the debts that are used as pretext for austerity have emerged on the continent. In the UK, I am part of a group called Debt Resistance UK. We have recently started to do similar work in the form of auditing local authorities’ debts, which is why some of us attended the Barcelona event to learn from the Southern European experiences. Although the term “debt crisis” has disappeared from the vocabulary of media and politicians, the rationale that debts are unquestionable still underlies the austerity drive. But if the debt crisis is over, it is only because the normalisation of austerity has been successful: the economic crisis has turned into a humanitarian one. Their interconnectedness is obscured by the narrative ‘there is no alternative’ to the prolonged state of economic emergency. “Debt is a tool for shock therapy, it is used against fundamental human rights. For this reason it is important to delegitimise the accumulation of debt and expose its illegitimate or odious nature”, explains Éric Toussaint who opens the panel with a thorough introduction into debt audits. He heads CADTM, an organisation that has challenged unjust debts for decades. Audits can be governmental, judicial or citizens’; but citizen pressure is usually necessary for a governmental audit to be established. This was also the case in Greece, where Zoe Konstantopoulou became President of the Hellenic Parliament after Syriza won the elections in January. She used her position to start an official debt audit, the Truth Committee of Public Debt. “The Committee was a success because it proved what people thought: that the debt is unjust”, Konstantopoulou says. She explains that a movement calling for an audit was first born in 2011. The audit grew into a social demand in the subsequent years, paving way for an official commission. It published its findings in mid-June, declaring Greek debt illegal, illegitimate and odious – the latter a legal term for debts that have not been accumulated with the consent and in the interests of the people. But as we now know, Prime Minister Tsipras chose to not use the argument to denounce Greece’s debts. Zoe Konstantopoulou’s successor, the new President of Parliament Nikos Voutsis, has since removed the Committee’s report from the Parliament’s website and evicted it from working in the building. But Konstantopoulou is defiant: the work will continue, she says, praising the response from wider society. A change in government is one of the reasons Jezabel Goudinoff thinks citizen participation in the audit process is fundamental. She is part of Citizens’ Debt Audit Platform (PACD), a movement that emerged from the millions who took to the squares of 15M across Spain. But the participative approach goes far beyond practicalities – such as that more people involved guarantees more publicity. For PACD, it is a fundamental part of creating more democratic structures. “We think illegitimacy is a political concept and what is illegitimate or legitimate needs to be decided by the people, society as a whole. This is why we need a citizens’ audit that goes beyond the financial”, Goudinoff explains. “We understand it as a tool of social transformation and as such, permanent.” Communication and educational processes are vital for achieving participation. Additionally, she emphasises the need to connect with other sectors, such as workers’ struggles, health, education, environment, gender or migrants’ rights, as well as look at the impacts of debt on these. This is why PACD and many other audit campaigns do not solely consist of economists – Goudinoff calls herself an example of what popular education can produce. That audits are not just about the technicalities of debt but about democracy is an underlying thread in the speeches. Goudinoff suggests the technology for more participation is there. And indeed, Spain’s capital and most indebted city Madrid has recently started a debt audit. The Council’s Treasury Adviser Carlos Sánchez Mato hopes it will become a participatory process, with links to the barrios or neighbourhoods. “What has helped us most to start the processes of a debt audit is corruption. There has been much attention on illegal and illegitimate debts raising from corruption. Debt is a more profound problem, but it is important to take opportunities that arise”, he explains. Madrid is one of the councils that were taken by progressive forces in Spain’s local elections last May. Since, the governing Ahora Madrid has drastically reduced the amount of money the council spends on debt repayments, simply by disobeying the law – similar to Eurozone fiscal pact and the UK Charter for Budget Responsibility – that seeks to ‘rationalise’ public spending by curtailing it. “We want to go much further, but we are starting here because it is liberating us €500m that can go to social spending”, Sánchez Mato explains, speaking of social sustainability of debts rather than financial sustainability. Back in Barcelona, the city’s main problem is not debt but budget surplus: as a result of the law that seeks to set austerity in stone, the council is left with over hundred million euros they cannot use. 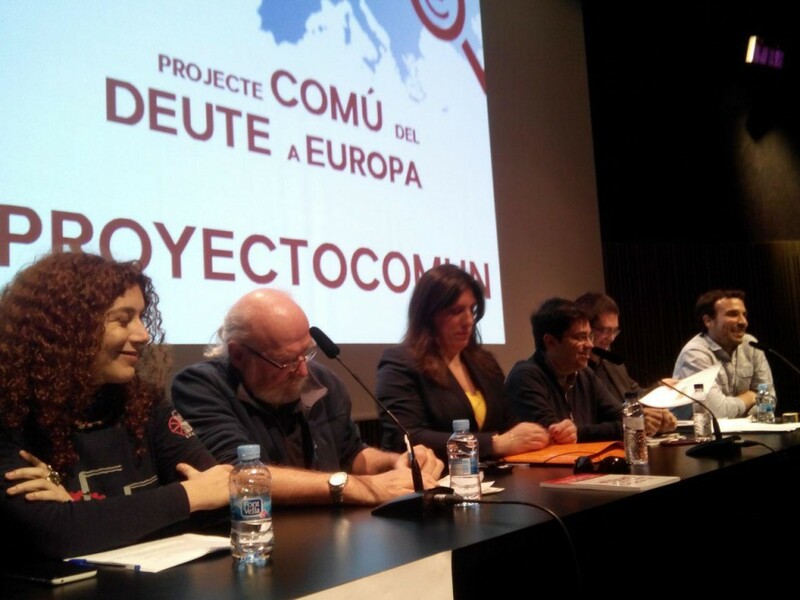 However, the Council – taken by Barcelona En Comú in the local elections in May – managed to liberate €138m that could not be used for social spending. It was used for cancelling debt instead, Deputy Mayor Gerardo Pisarello explains. “It is a very rare and strange situation, but exposes the paradoxical logic of austerity”, he says. Another problem Pisarello brings up is the internal audit system of the council. “As part of the ‘capitalism of friends’ or fraud in the system, one of the problems is that most of the audit services are outsourced”, he says – to private companies that have often been complicit in privatisation processes. This again sounds familiar from a UK context: the Audit Commission that oversaw the auditing of various public bodies was scrapped earlier this year. UK government also seeks to rid itself of the Freedom of Information Act that enables citizens to acquire information from any public body. It is the main tool Debt Resistance UK have used for research into local authorities’ finances. Yet financial products are often so complex that public officials or individuals have little hope in deciphering them, underlining the case for education. Much of the power of finance rests on the obscure structures that uphold it: hence demanding we “see the bill before we pay it” as Jezabel Goudinoff says is in itself revolutionary. Another key pillar of the hegemony of international finance is the lack of official arrangements. This of course follows from decades of deregulation, but also from an imbalance of power: for example, in the absence of any official mechanisms to deal with sovereign debt crises, the unofficial arrangements such as Paris Club are creditor-dominated. In this context, citizens’ debt audits are a fundamental tool for reclaiming the power that belongs to the people.